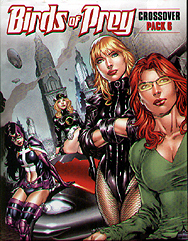 Add this Crossover Pack to any DC Deck-Building Game to play as the preeminent all-female covert ops team, Birds of Prey! This expansion introduces exciting card rotation mechanics. When the time is right, you're really going to soar! Oracle, Black Canary, Huntress, Catwoman, Katana, and Batwoman! All-new Super Hero, Equipment, Villain, Hero, Super Power, Location, and Super-Villain cards! A copy of any DC Deck-Building Game is required to play.